According to their website, Ben asked Sheri to dance because he liked the way she smiled while she danced. To see Sheri’s smile in person it is very easy to see why he was attracted it. Smile’s run the gambit of meaning, Sheri’s smile is uncomplicated and uncompromising joy. I hold to the belief that your soul reveals its self when you dance. Who you are at your inner core will come creeping out in spite of all attempts to cover it up. No matter how amazing your technique is, how much you practice, how much you think you “feel” it, if your soul is ugly, you can’t hide it and it will ultimately hold you back from taking the step from good dancer to great dancer. To me, Ben and Sheri are transparently good people. They work hard, have a beautiful family, they are great dancers and have an aura around them that people gravitate to. Their dedication and respect for swing dance has now made them some of the keepers of its preservation. As the generation of Frankie Manning passes its people like Ben and Sheri (who studied with Frankie) that are our only links to the origins of Lindy Hop. Their teachings are now the verbal gospel on the subject, for nothing was ever really written down in its evolution and discovery about instruction. I’m grateful that Ben and Sheri have been given this task (whether they know it or not) because they make learning truly accessible. Whether it is via, privet instruction, their weekly Wednesday night classes, their dance troupe or their monthly party, Third Saturday Swing, they are out there perpetuating the dance and making a special experience for people to enjoy. 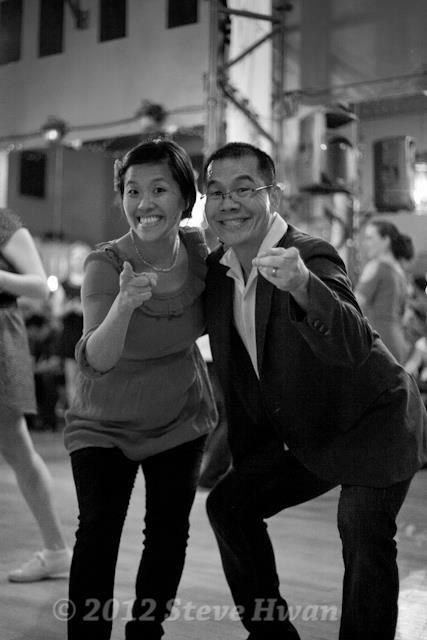 As teachers, like the Lindy Hop, Ben and Sheri are very grounded. They have maturity and security in themselves which makes them easily approachable. They will never knowingly intimidate or put down a student. Their critiques are well phrased with the intention of improvement and when praise is given you know it was earned and truly merited. As a student, when frustration becomes over whelming their patience as teachers is inspiring. As they dance together to show you what the step should look like, you remember your goals and even make new ones. Sheri flashes that smile, her warmness melts away your frustration and as Ben lets out his infectious laugh, you want to get up and try again. This entry was posted in ballroom, dance, lindy hop, students, swing dance, teachers, teaching, Uncategorized and tagged Dance, Lindy Hop. Bookmark the permalink.